Good ideas seem to come to us at the strangest moments in the strangest places. Archimedes was allegedly soaking in a bathtub, Descartes was in bed, and well, Isaac Newton was sitting under an apple tree. Is this a coincidence? Does where you are impact on how or what you think? Are some places more creative than others? Can design influence creativity? When talking about creativity, people seem to believe that there is a separation between the left brain and the right brain. 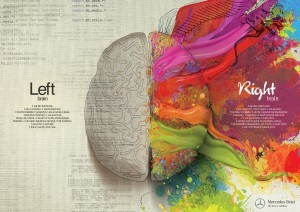 Creativity lives in a secret spot in the right brain, but the analytical left brain runs the show. This is untrue. We all apply creativity to solve complex problems, which requires different cognitive skills. We need analytical thinking to understand the problem, more creative thinking to generate alternatives, motivation to keep going and again analytical thinking to test the suitability of each solution. Creativity is therefore not limited to that one ‘magic aha-moment’, but happens in six iterative and overlapping stages: (1) Problem recognition (2) Preparation and definition, (3) Incubation, (4) Illumination and (5) Verification, and (6) Selling the idea. (Wallas, 1926). To understand the impact of design on creativity, I would like to highlight three cognitive factors that play a major role in creativity: attention, motivation and emotion. Attention, which is regulated in the prefrontal cortex, is important in all stages of creativity. In stages 1,2 5 and 6 we need increased attention, whereas in stages 3 and 4 attention is actually counterproductive. People who were asked to do a mindless task in the middle of a creativity experiment performed better than people who worked on a task that required focus. In this stage the mind needs to wander. When the mind wanders, the right hemisphere of the brain emits alpha waves. These brain waves are still a bit of a mystery, but they appear to be a precursor to that ‘aha-moment’. Hot water directly increases alpha waves, perhaps that’s why so many eureka moments happen in the shower. Fatigue can make it more difficult for people to concentrate, therefore night owls tend to be more creative in the morning and early birds have more original ideas late at night. Creative thought is also heightened just before going to sleep or when we first wake up. Coffee, stress and anxiety have a negative effect on creativity, because it tends to put you in a more analytical mindset. Alternatively, a drink of alcohol or the use of marihuana or amphetamines have been found to loosen the mind. Less focused attention doesn’t mean the prefrontal cortex switches off. Our working memory still processes and monitors our thoughts and connects it with ideas stored in our long term memory. So if you are stuck with a problem, take time out, step away, clear your thoughts. Often, the best way to solve a problem is to stop thinking about it. Or as Einstein put it: creativity is the residue of wasted time. It is a great feeling when you have that creative insight and all falls into place, but it takes strong motivation to overcome failure and rejection in the stages before that. Thomas Edison wisely said: “Genius is 1% percent inspiration and 99% perspiration”. Motivation can come from internal and external sources, such as status and money. Internal motivation encourages us more than external motivation. We are more internally motivated when the task is engaging, satisfying and or challenging. We also need creative confidence, a belief in our own creative aptitude. External drivers such as evaluation, rewards and a controlling culture can undermine intrinsic motivation. Goncalo & Duguid (2012) suggest that creative people are stifled by strong group norms. So to get creative, we need something that is engaging and challenging, but we need to feel that we are up to the task and that we have the freedom to make our own choices and experiment. Another common idea is that we need to be happy to be creative and that a bad mood stifles us. That’s why there is a tendency to create fun and happy workplaces. However, it is not that black and white. Emotions are not just good or bad, they guide our motivation, level of activity and decision process. Some emotions, positive and negative, activate and motivate us more than other emotions. Anger and sadness are both negative emotions but anger has a mostly positive effect on creativity whereas, sadness a mostly negative effect (Baas, et al, 2008). This is because anger is a motivating emotion that guides us into action, whereas sadness will drain energy levels. This perhaps explains why conflict and frustration in the first stage of creativity is not a bad thing. So to get creative, it is more important to find your drive and get active instead of just in a good mood. Creativity is a function of personal characteristics, characteristics of the physical context, the social context or organisational culture, and the interactions between these three. 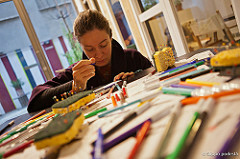 An overview by Furnham (2008) suggests that personal characteristics explain only 5 to 15% of the difference in creativity between two individuals. Therefore, culture or social context and physical context have a strong impact on creativity. This means that through behaviour and design we can influence creativity. This can be done through direct effects, implicit message, and the facilitation of behaviour. Our physical context can have a direct effect on our creativity by being a source of information as well as affecting our mindset. In general, creativity flourishes in light, airy and relatively quiet (below 70db) spaces, with high ceilings (3m+), and a direct window view. If you want to be more creative, find natural light and avoid fluorescent light. The presence of plants and greenery also sparks creativity (Shibata & Suzuki, 2004). Colour also has an effect. People come up with more original ideas after looking at a blue or green screen, whereas red triggers analytical thinking. We also draw information and clues from our environment. In one study, participants had to solve a series of puzzles. Half of the participants worked in a ‘clean’ environment, but for the other half subtle hints were placed in the room that they were in. The findings were astonishing: the second group solved significantly more puzzles than the first group. Perceptually and cognitively stimulating environments can bring inspiration through artwork, building materials and visual cues. In one experiment, people worked on a creative task for 45 minutes in a New York apartment decorated with traditional Chinese furniture. This original and different setting lead to sustained, higher levels of creativity (Leung et al. 2008). Our physical context reflects the identity and culture of the owners and its users and sends us implicit messages about how we are supposed to behave. Research shows that churches elicit religious behaviour even in people who are not religious and that people are more quiet in an environment that looks like a library. So creating an environment for yourself with a buzzing atmosphere, people interacting and moving around, a presentation of creative work (visuals and models) should make you more creative. Research shows that ‘less creative’ people benefit from being around creative co-workers. 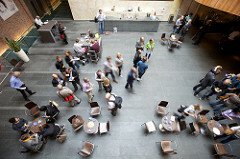 An open space could also symbolise an open culture with opportunities to critique or discuss ideas. 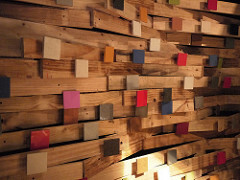 However, designing a space that projects a certain message requires a delicate balance. If people perceive a different message, or feel the design is inappropriate for the circumstances or if you are too obvious, the effects are minimised. Not only that, the social context has a strong influence too. There needs to be synergy between how things are done and where it is done. A creative brainstorm on a beanbag with a controlling manager is a sure waste of time. As creativity requires different cognitive activities at different stages, perhaps different contexts are needed throughout the process. The incubation and illumination stage require more private spaces for quiet personal thinking, because people who brainstorm alone produce more original ideas and are not hampered by group think. We need to get in the zone and an interruption will set our brain back by 20-30mins. At other times interaction with others can help define the problem, exchange ideas and validate the solution. We therefore need to be close to and see other people. We are ten times more likely to talk to a person who sits next to us (Allen, 1984). People who work within 10 meters of each other are not only more likely to communicate, the quality of their creative work is also higher. The likelihood of work-related communication with a person who sits more than 50 meters away is close to zero. Digital communication tools haven’t changed this. However, you shouldn’t collaborate continually with the same people close to you. Firstly, close knit teams are more likely to fail, and secondly network theory tells us that you are more likely to get new information through people who are not in your direct circle. At Pixar, people get a desk space assigned by a producer based on what they are doing, not which team they are on. First and foremost, a creative space should be open, light and airy with lots of natural features. A creative space should provide different types of spaces that fit the level of focus and attention needed at each stage in the creative process. Penn et al. (1999) highlight the importance of different types of spaces to meet the required level of privacy, interaction and noise. If our environment does not allow us to do what we need or want to do, it might lower our creative confidence. Different types of spaces would also give us options and in turn inspire a sense of freedom and personal control. A creative space should also be rich in features and fresh to stimulate us to be physically active, to inspire our creative thinking and offer distraction when we need it. We need to have visual contact and interaction with other people. Facilitate cross-fertilisation by locating people together and pushing interaction. In neighbourhoods with wide streets and few corner shops, social interaction between strangers is less likely. We need to see other people being creative. The design of the space should be flexible so it continually feels fresh and original. However, the message that the workplace sends out should be one of creativity, but at the same time be appropriate for the people working there and the culture of the organisation. If it looks as if you are trying too hard, people will not respond. Sadly, according to 10.000 people surveyed by the Leesman Index most workplaces do not support creative thinking. Even the wildest of workplaces cannot, despite the executive hopes placed in it, disguise, the daily reality of an uninspiring role or counterproductive work culture. Seth Godin put it beautifully: The most efficient way to get the behaviour you’re looking for is to find positive deviants and give them a platform, a microphone and public praise. Strategic role for designers work together with business service units as well as top level management. Contrary to popular belief, creativity can be developed and nurtured. New ideas need to be linked to existing knowledge and experience, so the peak of a person’s creativity does not lie early in life. Expose yourself to new experiences and various types of information. Participate in the creative arts and develop your creative mindset. Get out of the box and carry something with you to record your creative thoughts, because you never know where your next big idea is coming from. Allen, T. J. (1984). Managing the Flow of Technology: Technology Transfer and the Dissemination of Technological Information Within the R&D Organization. Cambridge, MA: MIT Press. Baas, M., De Dreu, C. K., & Nijstad, B. A. (2008). A meta-analysis of 25 years of mood-creativity research: Hedonic tone, activation, or regulatory focus?. Psychological bulletin, 134(6), 779. Furnham, A. & Bachtiar, V. (2008) Personality and intelligence as predictors of creativity. Personality and Individual Differences, 45, 7, 613–617. Goncalo, J.A. & Duguid, M.M (2012). Follow the crowd in a new direction: When conformity pressure facilitates group creativity (and when it does not). Organizational Behavior and Human Decision Processes, 118(1), 14–23. Killingsworth, M.A. & Gilbert, D.T. (2010) A Wandering Mind Is an Unhappy Mind. Science 330, 932. Liberman, N. and Shapira, O. (2009). An Easy Way to Increase Creativity. Scientific American, July 21. Leung, A. K., Maddux , W.W., Galinsky, A.W. & Chiu, C (2008). Multicultural Experience Enhances Creativity. American Psychologist, 63 ( 3), 169–181. Penn A, Desyllas J, Vaughan L, (1999) The space of innovation: interaction and communication in the work environment. Environment and Planning B: Planning and Design, 26(2) 193 – 218. Shibata, S. & Suzuki, N. (2004). Effects of an indoor plant on creative task performance and mood. Scandinavian Journal of Psychology, 45, 373–381.